In this tutorial we crochet layered flower with popcorn stitches in the center. Two layers of petals located the way that the bottom petals are between the petals on previous level. To crochet this flower will bring you a lot of fun and does not take much time. Enjoy the tutorial! The Sheruknitting.com presents a lot of knit and crochet video tutorials (lessons, master-classes) for masters and beginners. You will learn how to crochet and knit many thing. Discover a lot of new techniques and methods of knitting and crocheting. You'll learn how to knit and crochet 3D flowers; how to decorate knit wear (knit scarfs, knit hats) with hand made flowers. 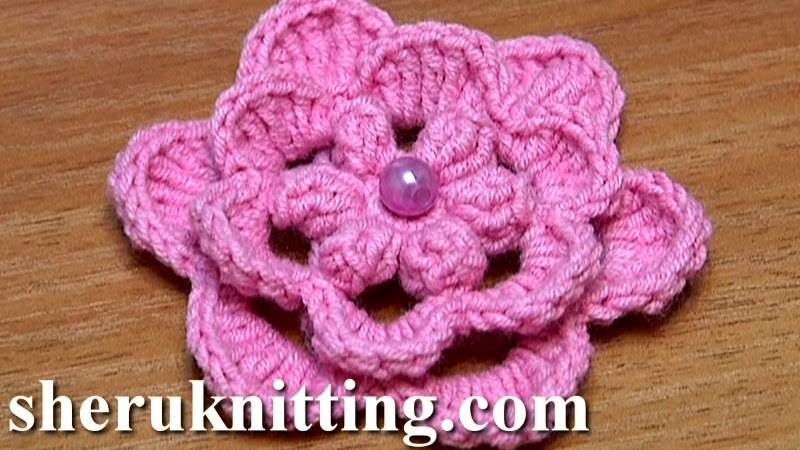 Following our step by step video tutorials you'll be able to crochet flat flowers and 3D flowers. We will show you many ways how to decorate your dress, pullover, cardigan, top, sweater, tunic, purse and many other things with hand made flowers. On Sheruknitting.com you'll find plenty of ideas of knit wear for babies and kids. With Sheruknitting.com Tutorials for beginners you can work out any knit/crochet pattern or difficult chart. Join to Sheruknitting.com and we answer to any of your questions: How to crochet flower? How to crochet a hat for a baby? How to use crochet or knit pattern? How to read crochet or knitting chart? Welcome with any questions! We will give you detailed answers and provide with many free patterns.